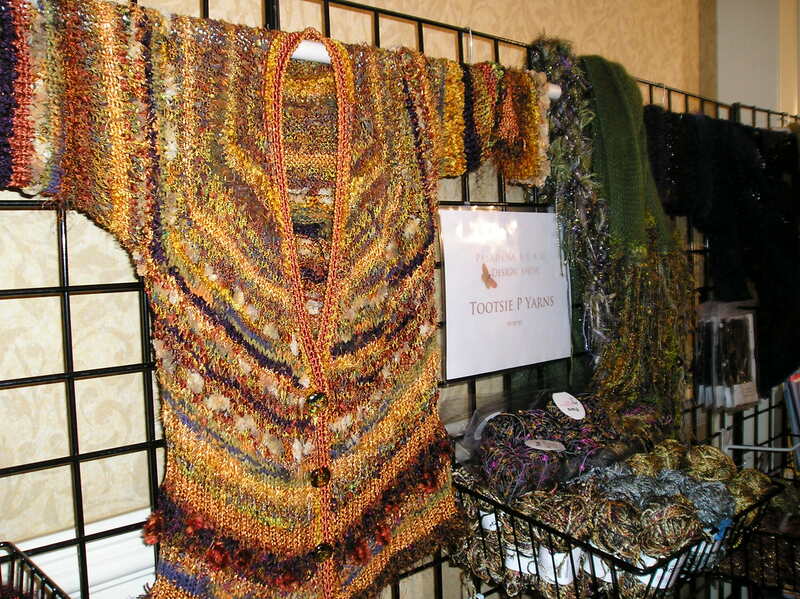 So, in my report yesterday I forgot to mention one of my favorite booths, Tootsie P Yarns. 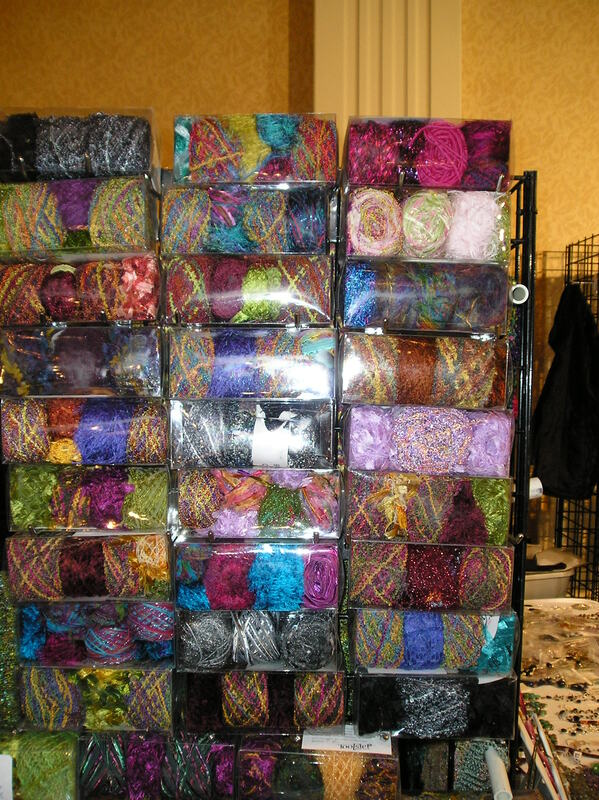 Check out all these amazing packs of novelty yarns on the left. I think I’m in love. 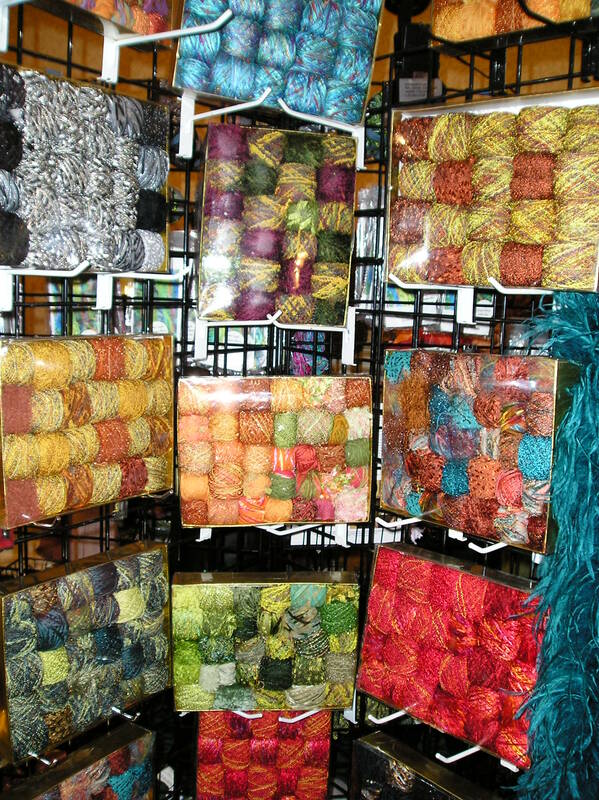 Tootsie P is based in Long Beach (a beach city about 20 miles south of downtown Los Angeles) where she sells kits and custom designs that combine a variety of yarns within each piece of clothing. 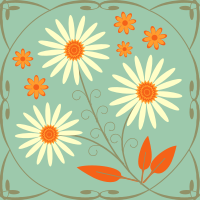 The color combos are very vibrant, which I love, and there’s a lot of variety of color ranges–warm and cool colors, metallics, mattes, earthtones and neutrals, brights and neons, dark and light colors, pastels, and everything in between. You would really have to try hard not to find an appealing color palette. Here’s a side view of some of the same containers. The yarn brands represented include Trendsetter, Colinette, Bollicine, Cascade, Filatura di Crosa, Prism and Habu (mmmmmmmm….. Habu…..). Sorry, got sidetracked there for a moment. Bonus points for anyone who can identify the individual yarns in the photos! Tootsie P calls her designs and hand-knit clothes and accessories “wearware.” She was gracious enough to talk to me for a while when I mentioned that I was something of an aspiring designer myself. I get the feeling that she’s in the process of starting out, so let’s all support her. Need any novelty yarn? Want to make yourself or a friend something truly one-of-a-kind? Next Post Woven Stitch Table Runner Pattern is up!